Tottenham suffered a 1-0 defeat to Man City at Wembley on Monday night, and one player in particular came under criticism from fans for his performance. Raheem Sterling took full advantage of some poor defending from Kieran Trippier after just five minutes, as he produced an assist for Riyad Mahrez to break the deadlock. That ultimately proved to be the winning goal, and while his performance didn’t improve a great deal thereafter, that early mistake from the England international earned him a harsh reaction on Twitter, as seen below from some fans. Spurs were guilty of missing opportunities as the game went on with a poor Wembley pitch not making life any easier for either side, but it was City who eventually prevailed as they moved back level with Liverpool at the top of the Premier League standings. 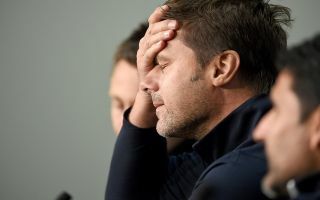 For Mauricio Pochettino and Tottenham, they will have to now bounce back from this setback as they continue to fight for a top-four finish, but it’s another game against a direct rival which will lead to question marks being raised over their ability to compete with the title contenders. Nevertheless, many Spurs fans were particularly frustrated with Trippier and don’t believe that it was merely a one-off, and so it will be interesting to see if Pochettino sees the same issues and opts to make a change when his side face West Ham United in the League Cup on Wednesday night and moving forward beyond that game. Goes without saying really, but Davies and Trippier are such a huge downgrade on the Rose and Walker of 2016-17. Trippier outdoing himself with two errors in one move. As much as he’s been good going forward this year, he’s been abysmal defensively. A pity as it was a reasonable start, with Sissoko having a decent opening 5. Raheem Sterling has made Kieran Trippier look like a right mug. The Kieran Trippier Defensive Experience continues apace.